7.71 points at 42 votes (rank 148). 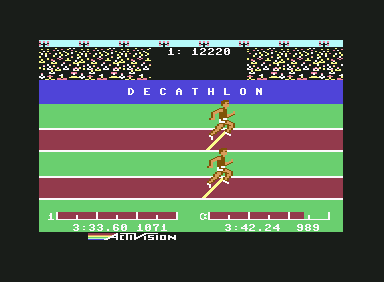 Decathlon is a classic in the sport genre and a simulation of the sport. There is a slight resemblance to Summer Games and Summer Games 2, whereby Summer Games has the Olympic Games as model and puts more emphasis on the rhythmical movements of the joystick. 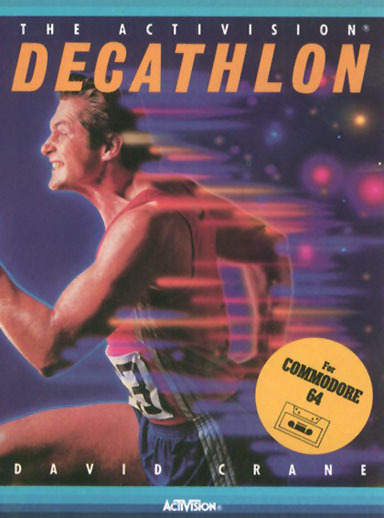 In return, Decathlon offers a big spectrum of sports, it was rather untypical for that time, to offer 10 single games wrapped into one. This game also counts as the killer application in all respects. Many a player has lost his joystick in this game due to technical knockout. The game is well designed for its time. Many animations await the player - not at all a matter of course for 1984. In return there is a lack of diversification. All sports approx. look the same, you always see a track on which you need to run. Only the single disciplines, at the end of the track, differ. The Atari versions are - due to the system - more blocky, but they offer more detailled scenes than the C64 version. The animations of the game are all fluent. They do not seem as accurate as in Summer Games but this does not carry that much weight. In addition, the edges of the characters are a little on the thick side, while details inside the frame are drawn very finely. However, there are a few small graphical gimmicks. If you play the game without human teammates, you get shown the player C= instead of player 2. The controls are the same in all 10 sports. First, speed needs to be built up by a fast and at best steady movement of the joystick and then the fire button needs to be pressed at the right moment. In running disciplines the programmers have even thought of putting in the end sprint. The character gets slower at the end of such a discipline and you need to move the joystick faster to rev it up again. Up to 4 players can compete against each other in a combined event mode. At the end, the results are compared and the ranks shown. Running competitions can - depending on the number of available joysticks - be done against the computer or directly against another player. It is also possible to practice disciplines without absolving the whole decathlon. Playing with the keyboard a player can accelerate better by keeping the arrow keys pressed and thus hold high speeds. Therefore there are also two highscore tables. Spaceball: "Joystick killer. Clearly a game, that I do not leave alone with my Quickshot joysticks." Rockford: "Joystick killer? And who does think of my pains?? A game, where you sweat and are close to exhaustion and even get muscle ache! Is this not the perfect realisation of athletics? The 1.500 meter race! I can remember having read a comic during this, while holding the Quickshot IV with its wishy-washy stick the wrong way to be able to only move the wrist in the right rhythm. Alternatively I can remember battles in which during the torture all possibilities of the shaking were used, including the change to the left hand.I can also remember my friend's contorted face, as he can probably also remember mine. Great! Additionally, the technically more challenging disciplines were also a lot of fun. With this enthusiasm, all that remains for me is to give this classic 9 points, although judged objectively, it would probably not deserve them." Robotron2084: "Wild rubbing of the joystick in its very original and extremely crackbrained glory. Mind you with substandard graphics. And with this a cover that "apparently" shows a runner on LSD. Outrageous! 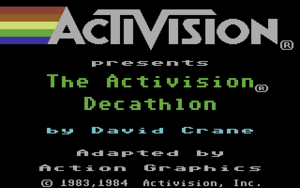 There is hardly any game that has provided for such a long-winded connotation when women were present as Decathlon. Nevertheless, it is an epochal masterpiece or botch, depending on the point of view, although I prefer Hyper Sports, alone because how it is presented. But that is just where it started on the C64, and I appreciate this here rather unemotionally with full 6 out of 10 points." Shakermaker303: "I also agree with the previous speakers. Absolute joystick destroyer! When playing the game with a friend, we always had a few replacement joysticks available. Whereby one needs to mention that the "Competition Pro - joystick" proved to be very solid and was used as a last mean or when all other "weapons" failed. For longer joystick escapades (e.g. 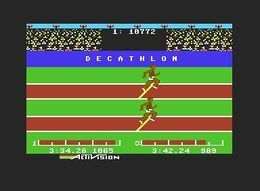 the 1500 meter death race) one liked to stand up during the shaking, placing the joystick on the table - which had the effect of a short improved performance, as the wrist did not hurt that much for a short time. However, the laughter of the competitors quickly made you lose the rhythm. Concerning the flow of the game, I like it better than Summer Games. The playability is faster and more fluent, although the graphics might seem a bit monotonuous - I like it. I give 9,44444 of 10 possible points." Agent U.S.A: "I can only agree to this all, the Quickshot IV story, the contorted faces of two players, that shake their joysticks wildly, the flow of the game, without loading times straight to the next event and on it goes. I also know the story of the joystick killer, until now I was lucky to be untroubled by this. At that time we thought that instead of a permanant fire, there should be a joystick that makes very fast left/right movements :). 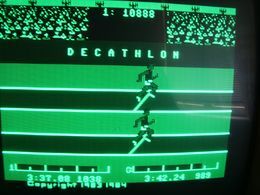 I always liked playing Decathlon and even more than Summer/Winter and World Games. The game is also in my list at the very top with 9 points." Mysticus: "Clearly a classic. 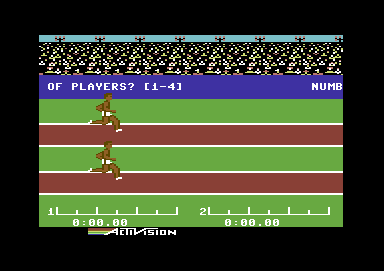 It beats the pants off many other sport games, although the graphics are made very simply. The multiplayer mode is legendary, probably almost everybody had sat with friends in front of the computer as a child. On the next day or even already on the same evening the parents are worried about the kid's muscle ache and bad tensions in the neck area, after all the son was only at the neighbour's to play computer, so what had happened this time? 8 points." Equinoxe: "What a lot of fun we had with this actually rather simple game. Which was probably because we made fun of our friend's faces while they worked on their joysticks. There was many a muscle ache after that. In retrospect, it can reach 5 points." Note: This version is not considered in the highscoremaster table!